The Rotary Club of Canby presented The Canby Center with a check for $25,700 last Friday. The club raised the funds to support expansion of TCC's kitchen facilities at the Rotary's Octoberfeast event attended by nearly 170 people recently. Of the total, $6,500 in gifts were matched by Clackamas Federal Credit Union and Gingerich Farms Products, Inc. 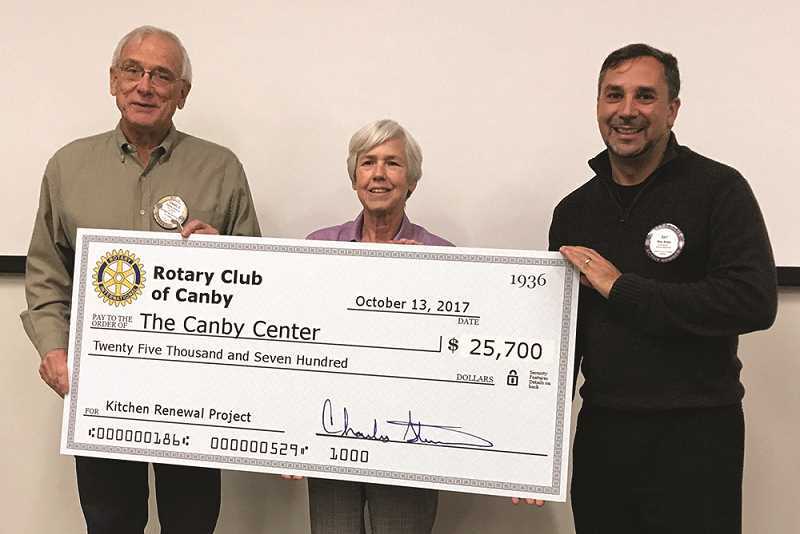 The Rotary Club has contributed or raised $36,417 to date for The Canby Center's kitchen project. The Canby Center's kitchen has been used to provide nearly 1,000 meals and redistribute more than 84,000 pounds of food to the homeless and low-income families in the last 12 months. Still, the kitchen is in poor shape and needs serious attention according to Executive Director Ray Keen. "People who are facing life's challenges often feel hope slipping through their fingers," said Keen. "We want to create a space where our guests have 'kitchen table' conversations and are strengthened in their dignity. The Rotary Club of Canby is helping us do just that." The remodel of the kitchen is designed to facilitate a 25 percent increased availability of hot lunches for those with immediate needs, and a 20 percent improved collection and distribution of food for families and to support healthy cooking classes. The total cost of the project is estimated at $135,000, with $84,896 raised to date. Construction is anticipated to begin in December 2017. Anyone interested in supporting the project can give at thecanbycenter.org/donate/ or by calling 503-266-2920.